This applies not just to business, but to every subject you will learn or have learned in life. Knowing the path ahead of you makes the road ahead easier to travel on. There are traps along the way, preventing your continued progress and being aware of them helps you to overcome them when they appear in your path. These are the 5 Phases of Business Evolution on your journey of success. Which one of these do you relate to the most? Are you proud of your industry knowledge and technical prowess and feel your path ahead will be fine but advice seems to be too expensive? With your own business growth, are you unsure who to trust and doubt anyone understands you or your business well enough to mentor you? Do you accept you need a mentor with your business, someone who has been where you’ve been, understands what you need and can accelerate your progress? Do you feel you know nearly as much as any adviser or mentor and feel there’s little left you haven’t heard of before? Have you been in business for years, probably had a business coach or two, have learned much, but recognise there’s still so much more to learn? These are 5 examples of the mindset of business owners in each phase of business evolution. Sales skill – e.g. have you had sales training? If no, that’s denial of the need for it. If you talk too much when selling that’s justification. Quiet Confidence salespeople talk much less than the person they are talking to. Management skills – do you love spreadsheets? No, then you’re not in Quiet Confidence! Do you feel you’re ready to learn more about management? Congratulations, you’re ready for the Academy of Business Mastery! Marketing skills – do you think paying for someone to do it all for you – i.e. website developer, social media marketer, SEO company. Then that’s Denial. If you haven’t been to workshops and read 50 books you’re not up to Acceptance yet. People skills – do you believe you never need to use anger or criticism with employees or customers ever? That’s one aspect of people skills that displays Quiet Confidence. Your prospects will also be in one of the 5 phases when they contact your business. Selling is actual a leadership opportunity, as you’re “leading” people out of ignorance (fear and doubt) about knowing what and how to buy and into confidence about their buying decision. To lead a person best its very important to understand the follower, their mindset and how best to lead them their ideal way. The 5 Phases assists greatly with who you need to be to lead them while in the phase they are in. If you aren’t changing how you sell (lead) each person, you may struggle to reach very high conversion rates or be able to win sales at higher prices than competitors. Our clients, after training on this, often reach DOUBLE their industry average of lead to sale conversion rates and are usually selling at prices higher than their competitors. 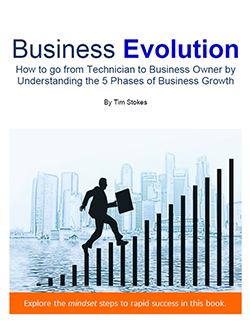 You can learn more about the 5 Phases of Business Evolution from the inventor of this concept and author of the book – Tim Stokes. Download the book for free – to assist you in choosing wisely any mentor on your success journey. It could save you many thousands of dollars!